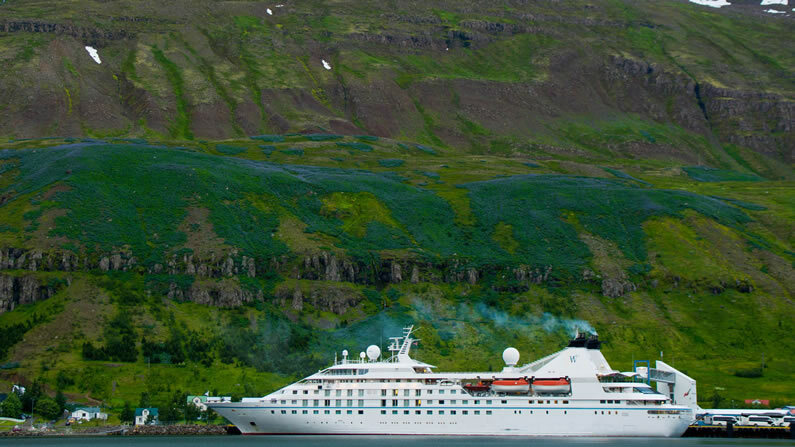 Dramatic scenery and curious communities coalesce on this week-long circumnavigation of Iceland. Explore a country few people will ever visit, and go far beyond the tourist hotspots to remote fjords, raging waterfalls, and small fishing villages. Get to know the independent and creative Icelanders, and watch whales and seabirds play offshore. This is yachting at its most inventive. 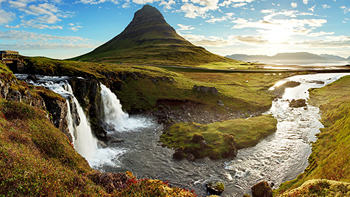 The dramatic terrain of Iceland, known as the land of fire and ice, encompasses volcanoes, glaciers, geysers, waterfalls and fjords. 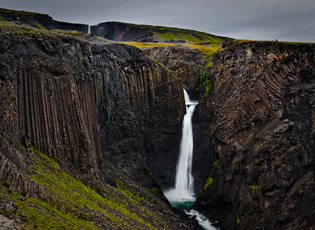 Many tours feature the geologically and historically significant Thingvellir National Park. Here, the North American and Eurasian tectonic plates meet on the Mid-Atlantic Ridge. 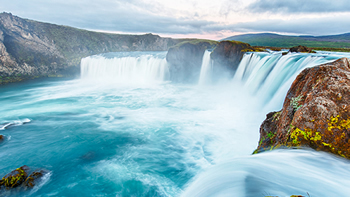 Iceland is also home to Vatnajokull, one of Europe’s largest glaciers; the famous Blue Lagoon, a mineral-rich geothermal pool set within a large lava field; and traditional horse farms and ancient Viking sites. 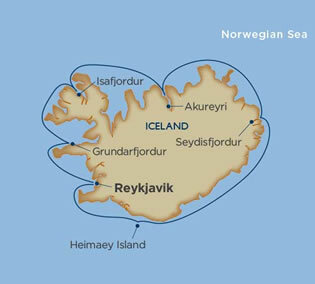 Iceland tours in the capital, Reykjavik, include the 19th-century Parliament House, Austurvollur Square and Tjornin Lake. • Meet a friendly Icelandic horse, brought to Iceland by the Vikings in the 9th or 10th century A.D. 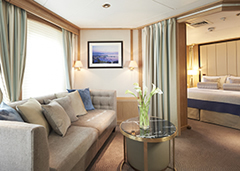 Completely renovated in 2016 and with only 212 guests, a Star Breeze cruise will make you feel like you're on board your own private yacht almost as soon as you step aboard. When you're ready to make an appearance, the lounges, club, casino, screening room, and library are waiting to be explored. 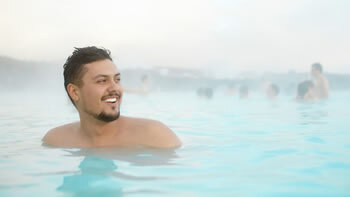 Take some "you" time in the tranquil WindSpa ... enjoy a dip in the pool ... work off that decadent dessert in the Fitness Center ... and, of course, you are always welcome to visit the Bridge to examine navigation charts with the Captain. Treat your eyes to crayon-colored buildings, eccentric architecture, and crystalline waterfalls cascading over velvet green hills in the world's most northernmost capital, as lively and spontaneous as the geothermal activity beneath its surface. 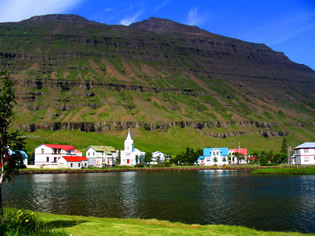 A place as unusual as its spelling, Seyðisfjörður is both a gorgeous fjord and a welcoming, creative town of about 700 souls. Keep your eyes open while we navigate the deep fjord to your Windstar Destination Discovery Event: It is home to puffin colonies – a type of auk that sports brightly colored beaks during mating season. Upon arrival in this achingly picturesque town, your eye will be drawn to the most prominent of Seyðisfjörður’s timber buildings – the photogenic Blue Church. This is where your Windstar Destination Discovery Event begins. 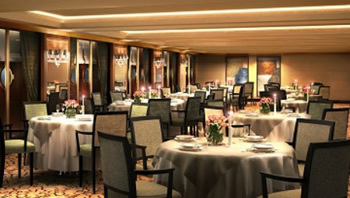 You will enjoy a concert there, as well as popular local drinks and canapés – including the Icelandic delicacy, reindeer meat. After the performance, a traditional ring dance will be performed outside the church. 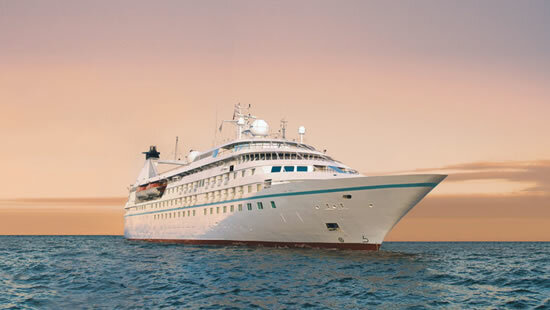 Windstar guests are encouraged to join in! Mingle with the locals or check out the local bar before taking the shuttle back to the yacht or walking the short distance on your own. Classic Suite. 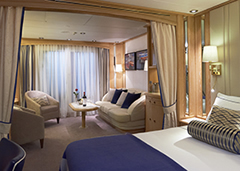 Relax in 400 to 530 spacious square feet. Your living area offers beautiful views from the forward-facing window and French doors onto your private veranda. Two spacious closets give you plenty of room to unpack. 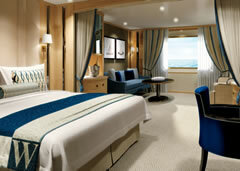 Balcony Suite. Stylish comfort and ocean views welcome you in 277 square feet. Your queen bed (which can be separated as twins if you prefer) features luxurious Egyptian cotton linens. Enjoy a luxurious soak in your full-size tub or an invigorating shower, then wrap up in your waffle-weave robe and slippers, savor a treat from the fresh fruit bowl, or simply stretch out and enjoy the fresh flowers. Picture Window Suite. Stylish comfort and ocean views welcome you in 277 square feet. Your queen bed (which can be separated as twins if you prefer) features luxurious Egyptian cotton linens. Enjoy a luxurious soak in your full-size tub or an invigorating shower, then wrap up in your waffle-weave robe and slippers, savor a treat from the fresh fruit bowl, or simply stretch out and enjoy the fresh flowers. Single occupancy: individuals who prefer a cabin to themselves will be charged a 175% surcharge of the double occupancy rate. Share Occupancy is available. Initial deposit is $750 pp, Second deposit ($1000 pp) is due on December 1, 2018, Third deposit ($1500 pp) is due on February 15, 2019. Final payment is due April 15, 2019. 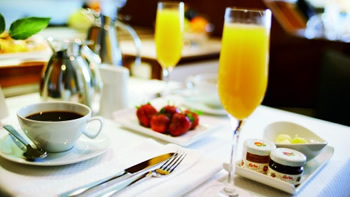 Extra Amenities for Source Events group: Airport/Host Hotel transfers to the ship and Hosted cocktail hours.